The expert plumbers at Boris Mechanical are fully certified for testing, repairing and installing all commercial backflow prevention devices. While many professional plumbers are qualified to handle most plumbing jobs, you should make sure that you hire a commercial plumber who is fully certified in backflow service and prevention to install and inspect your device. Our commercial plumbers are highly trained and certified to install and maintain all types of backflow service and prevention devices in the New York City area. We are always glad to answer any questions about backflow prevention and certification, so feel free to call us any time. Back pressure is another way that an undesirable contaminant may enter your potable water piping. Sources of back pressure may be pumps in the water distribution system, boilers or heat exchanging equipment and even power washing equipment. In these cases you may have an almost constant risk of overcoming the static water pressure in the piping and when chemicals are used, as they are for commercial/industrial descaling (boilers) or residentially as in deck/siding cleaning such as bleaches (power washing), you would benefit greatly from having a backflow preventer. To prevent such an occurrence, many regulatory regimes require there to be an air gap or mechanical backflow prevention assembly between the delivery point of mains water and local storage or use  Where submerged mains inflow is permitted a backflow prevention assembly is required. In this way the backflow prevention assembly protects the potable water system from contamination hazards which can be severe. 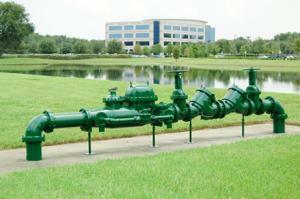 There are over 10,000 reported cases of backflow contamination each year. Some cases can be fatal.